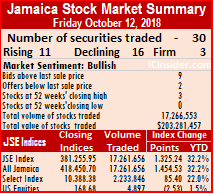 The Jamaica Stock Exchange main market captured another record high, in trading on Friday, with the All Jamaica Composite Index hitting 419,855.25 with just 40 minutes before midday. 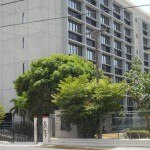 The market pulled back by the close to end at a record close to be up by 32 percent for the year. 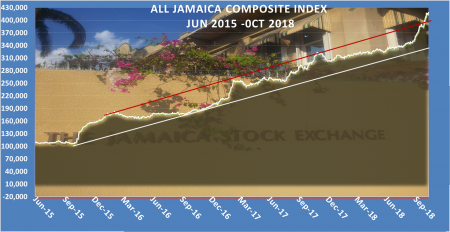 At the end of trading, the All Jamaica Composite Index advanced by 1,454.53 points to record closing high of 418,450.70 and the JSE Index gained 1,325.24 points to record close of 381,255.95. IC bid-offer Indicator| At the end of trading, the Choice bid-offer indicator reading shows 9 stocks ending with bids higher than the last selling prices and 2 closing with lower offers. A total of 30 securities traded including 1 in the US dollar market, compared to 32 trading on Thursday with the prices of 11 securities rising, 16 declining and 3 holding firm. 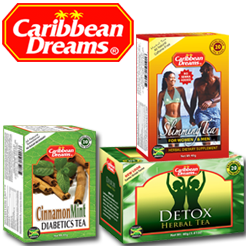 Barita Investments ended at a 52 weeks’ closing high of $20, Mayberry Investments closed at an all-time high of $11.50, and Jamaica Producers ended at a 52 weeks’ closing high of $33 and Sagicor Group traded at a 52 weeks’ intraday high of $43.01. Trading ended with 17,261,656 units valued at $203,142,878 changing hands, compared with 5,137,117 units valued at $72,997,097 on Thursday. Trading closed with Wisynco Group with 8,160,974 units and 47.3 percent of the day’s volume, dominating trading, followed by JMMB Group 7.5% preference share with 6 million units and 34.75 percent of volume traded and Scotia Group trading 960,106 units or 5.6 percent of the day’s volume. Trading resulted in an average of 595,230 units valued at $7,004,927, in contrast to 197,581 shares valued at $2,807,581 on Thursday. 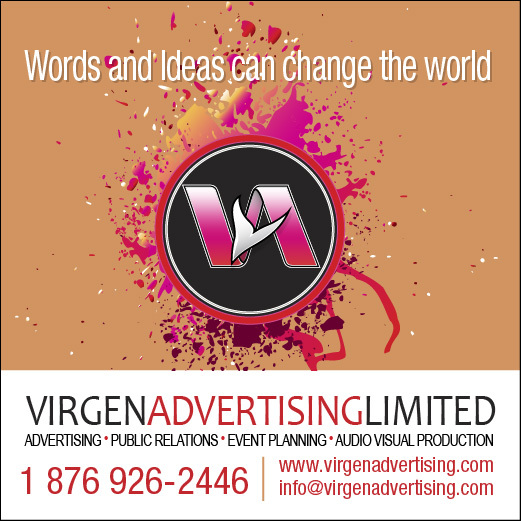 The average volume and value for the month to date amounts to 406,926 shares, valued $7,181,976 and previously, 387,353 shares, valued $7,202,432. September closed, with an average of 1,022,243 shares valued $15,752,876, for each security traded. 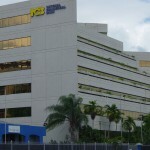 In the main market activity, Barita Investments gained 50 cents and closed at a 52 weeks’ high of $20, trading with 10,951 shares, Grace Kennedy lost $1.48 and ended trading at $59.50, exchanging 93,322 shares. 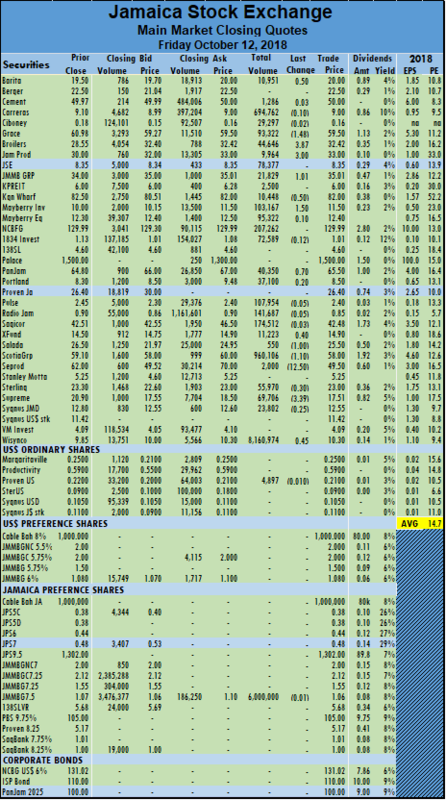 Jamaica Broilers jumped $3.87 in trading 44,646 stock units to close at $32.42, Jamaica Producers finished $3 higher to a record close of $33 with 9,964 units changing hands, JMMB Group gained $1.01 and ended at $35.01, trading 21,829 shares, Kingston Wharves fell 50 cents in exchanging 10,448 stock units, to close at $82, PanJam Investment closed 70 cents higher to $65.50, with 40,350 stock units trading, Sagicor Real Estate Fund rose 40 cents to $14.90, trading 11,223 shares, Salada Foods fell $1 to $25.50 in trading 550 shares, Scotia Group lost $1.10 trading 960,106 units to close at $58, Seprod dropped sharply by $12.50 and finished trading at $49.50, with 2,000 shares changing hands, Supreme Ventures dived $3.39 to end at $17.51, with 69,706 shares changing hands and Wisynco Group advanced 45 cents to end at $10.30, trading 8,160,974 shares. Trading in the US dollar market closed with 4,897 units valued at US$1,046, changing hands as Proven Investments was the sole stock trading and fell 1 cent to close at 21 US cents. The JSE USD Equities Index lost 2.53 points to 168.68.